I purchased my cleaner from my local pool shop in Australia about 12 months ago. It cleans brilliantly! 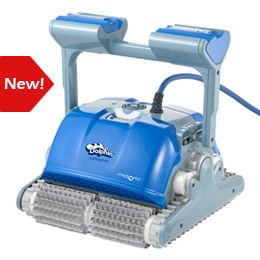 I said I would never have another Robotic Pool cleaner again after owning a Waterco Nitro. But i'm glad I was convinced otherwise. The guys at Maytonics in Perth came out and did a free home demo in my pool and the staff were so friendly and set my machine for me and went through step by step on how to use it (which was very simple). It does exactly what the brochures claim it will. The cartridges are so much easier to clean than the bags - which is a big deal. I found bags to be quite a nuisance to clean. It comes with a remote control so I can spot clean if needed and a timer on the power supply that I can set so the machine automatically comes on at certain times each day. The machine comes with a 3 year warranty which in itself gives me absolute faith in the product. No other robot has that warranty from what I have read. It has a third brush on the bottom to scrub the floor and walls, and it even scrubs along the waterline. I can set it to super clean, do just the floors, just the walls or both. I can even set how long the cleaner runs for. My pool gets a lot of debris in it, and when I use my robot, my pool is spotless EVERY time. It even go's up the steps most times. I havn't had a single issue with this machine and highly recommend that if you are thinking about purchasing one, don't go past the Supreme M5.